The session on Thursday turned out to be much on expected lines as the NIFTY headed nowhere for the major part of the trade while remaining in much capped range. However, end of the session remained little sluggish than expected as the NIFTY ended the day with net loss of 50.75 points or 0.49% while adding fresh short positions. Overall, we will continue to see the Markets continuing to consolidate and spend some more time remaining subdued before it prepare itself to move past 100-DMA levels. We are expected to see quiet to mildly positive start to the trade on Friday. However, NIFTY is neither expected to move past 100-DMA nor it is likely to breach any major support area. Friday will see the levels of 10395 and 10475 playing out as immediate resistance levels. Supports come in at 10345 and 10275 zones. 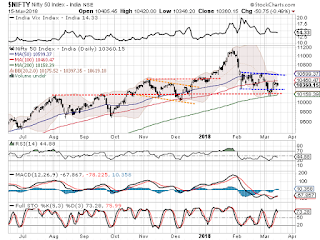 The Relative Strength Index – RSI on the Daily Chart is 44.8813 and it continues to remain neutral showing no divergence against the price. The Daily MACD stays bullish as it continues to trade above its signal line. No significant formations were observed on Candles. Pattern analysis reveals the credibility of the resistance area of 100-DMA as the NIFTY has resisted at those levels. 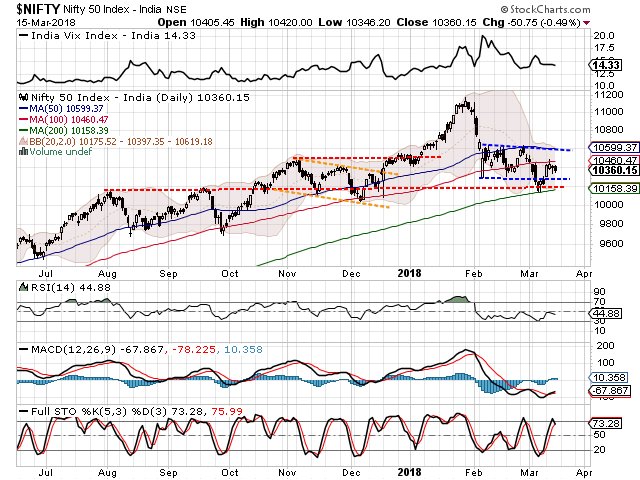 Also it shows and has established the support zone of the 10275-mark followed by the 200-DMA of the Markets. Presently it continues to trade in a rectangle formation which translates into a broad trading range. All and all, it is all likely that the NIFTY continues to oscillate and consolidate a bit more before it prepares for a fresh up move. In this process, the support of 10275-mark will be critical area to watch for. The F&O data which continues to show addition of shorts reiterates the limited downsides for NIFTY. Also, taking into account the performance of the broader indices and sector indices, it is evident that the Markets continue to exhibit positive bias. We reiterate avoiding shorts in the present scenario. Minor downsides cannot be ruled out but overall, this will be nothing more than some more consolidation which is ultimately likely to resolve itself with a directional bias on the upside. Fresh long positions were seen being added in stocks like IDFC BANK, COAL INDIA, RECLTD, DLF, ICICI BANK, L&TFH, ARVIND, NATIONAL ALUMINIUM, ASIAN PAINTS, EQUITAS, RPOWER and INFRATEL.